I’ve been toying with the idea of doing a series of writing posts. I thought I’d start with how I provide kids with something to write about during Work on Writing. Stick with me to the end and there will be a few goodies waiting for you. 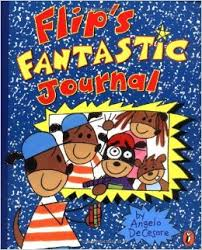 A couple of years ago, a colleague introduced me to Flip’s Fantastic Journal by Angelo DeCesare. My students connected with the text right away and each year we began to build our classroom expectations (illustrations, # of sentences, handwriting, etc.) around our own fantastic journals (just your average, everyday spiral notebooks). As my students progress as writers and build stamina throughout the year, I increase the expectations. For Work on Writing, our fantastic journals are a staple! If you haven’t had a class mascot or pet, I highly encourage you to make the investment. It is highly motivating for your most reluctant writers. If your mascot stays in the classroom, Monday is the perfect opportunity for students to write to the mascot sharing about their weekend. My students used these adorable pups for friendly letter writing practice. As a bonus, each student got to take the pet home a few times during the year and the only requirement was to write a letter to the class sharing about their adventures. You can read more about our class pets here. 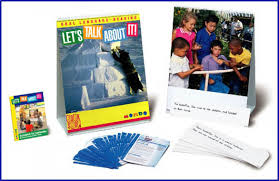 Do you have kids who can talk, and talk, and talk, but when a writing tool is in their hand they have nothing to say because they can’t remember? I have found success when I provide a visual to keep them on task and writing. Our district adopted MONDO for reading a few years back. One of the tools included was an oral language piece. It was intended just for that – oral language. For my students who do not struggle with oral language, I wanted to offer it as a tool for writing. It is a large flip chart of colorful photographs. They are not always great, but they do provide students with something to say (through writing, of course). Lately I’ve noticed a trend over on TpT….photographs are becoming a BIG deal! I’m seeing them on product covers everywhere. 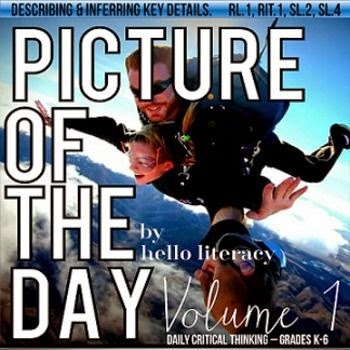 Jen Jones (Hello Literacy) has put together these two packs. 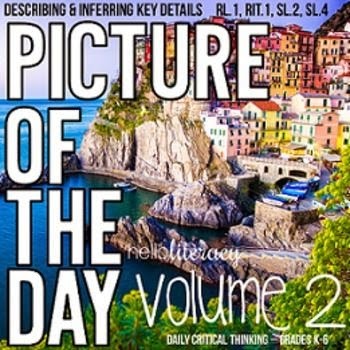 They are intended for describing and inferring key details, but in my mind they are visual candy and will have my students writing like crazy! Remember the fantastic journals my students work in? Every Thursday students are encouraged to go back and reread their early writings. Most of the kids giggle at themselves and then celebrate how smart and skilled they’ve become (teacher win). It’s a great time to practice revision (adding details, omitting off topic sentences, improving word choice, etc). About once a month, I pull out a collection of first drafts my class has written to a prompt. Students work on editing with a buddy and then write a clean copy. On the days that I do this, we start during our writing block. Then students finish up during Daily 5. In my room, this means students get to choose special spots (normally the kids have a certain day they get to work around the room). Yes, that means they can write next to a friend, on the floor, in the windowsill, etc. Since they know my expectations, they also know they can lose this choice and 99% of the time they work so hard to keep the privilege. If that doesn’t work, sometimes I’ll bring out some special writing tools. Kids love using the teacher’s pens. For kids who are working hard, I’ll quietly walk by and leave a little pen by their side. You’d be amazed at how quickly the 3 students nearby straighten up and get their pencils moving, too! If those ideas don’t work, take some inspiration from Show & Tell and implement Author’s Chair. Some kids just LOVE to be the center of attention (for the record….I was NOT one of those kiddos). I hope you found some useful ideas to take into your own classroom. 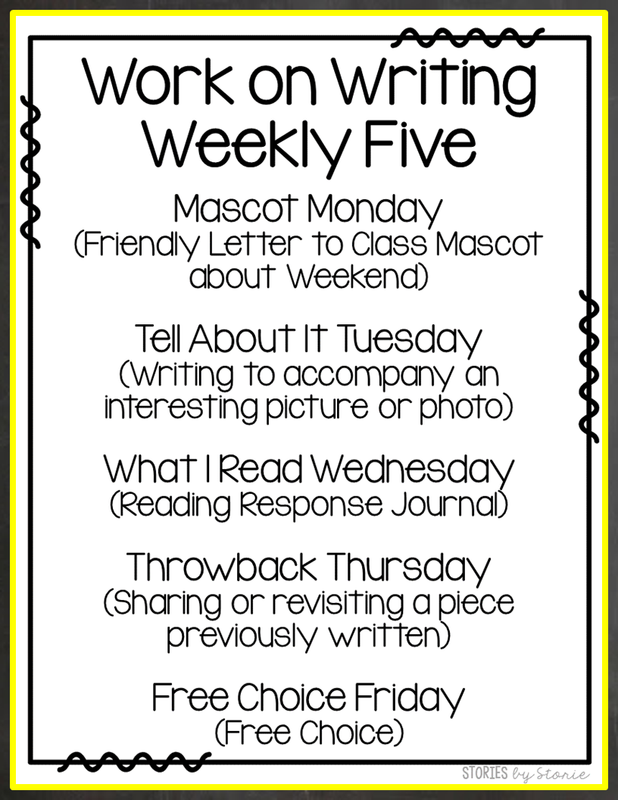 If you are interested in reading more about writing in my classroom, check out these posts. Or you can head over to A Burst of First to gather even more fresh ideas for Daily 5. I love this idea! I think I will try this out next year in my third grade. Thank you!